Portland-based animation studio Laika conjures another stop-motion marvel with Kubo and the Two Strings, which evokes the mysticism of ancient Japanese forklore as a backdrop for a timeless tale about the unbreakable bonds between family and the value of courage under increasingly trying circumstances. As its main character is a storyteller himself, the film also serves as a commentary on the importance behind the stories, both big and small, that we pass along to one another. From the self-referential opening line (“if you must blink, do it now”) to its poignant closing shot, this is a strikingly original piece of filmmaking whose story will no doubt be passed on again in the future. Our young protagonist Kubo (Art Parkinson) spends his days entertaining townspeople with origami figures that spring to life with every pluck of his magical shamisen and recreate scenes of valor and victory from the village’s collective history. At night, he returns home to his ailing mother to avoid the evil spirits that lurk about but while caught in the forest one evening, he is confronted by the apparition of his mother’s twin sisters and is subsequently driven out of his town. With the help of new friends Beetle (Matthew McConaughey) and Monkey (Charlize Theron), he sets out to find the father he never knew while also avoiding his treacherous grandfather known as the Moon King (Ralph Fiennes). 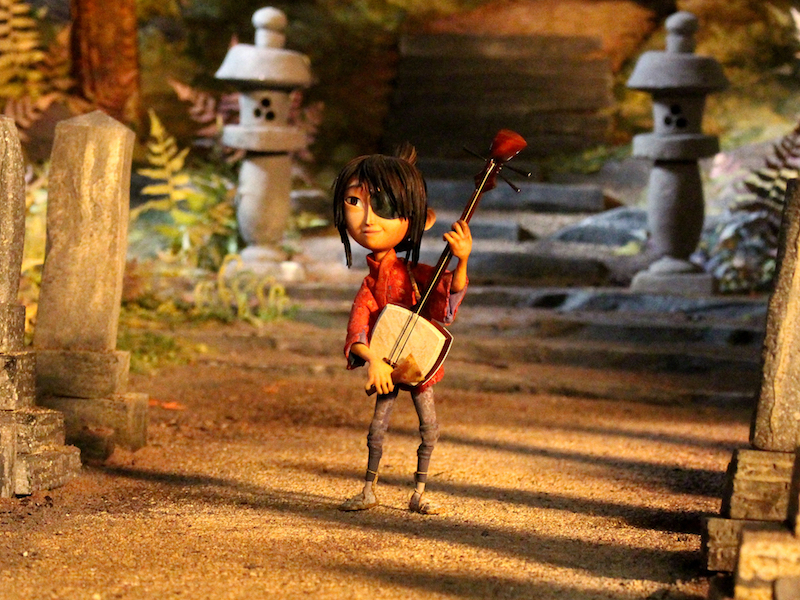 Put simply, Kubo and the Two Strings is the best looking stop-motion film that I’ve ever seen. Behind each frame rests the realization that every single detail on screen –every movement, every facial expression– was crafted by hand. Even a shot of wind blowing through a wheat field is enhanced by the knowledge that someone had to carefully move each strand of wheat to create a realistic effect. Sure, this is technically the case with every stop-motion feature but the scale here is unlike anything we’ve seen before. It’s one thing to animate two people talking in a room but it’s quite another to animate hundreds of flying leafs to come together to form a massive sailboat. The fluidity of this process is the biggest selling point, as this movie firmly progresses past the stilted look that has plagued previous entries in the genre, but the pure artistry behind each of these creations is dazzling in its own right. From the tiny, multi-colored origami birds that fill the sky to the 18-foot skeleton puppet that allegedly took the production team 6 months to build, the gorgeous design work is filled to the brim with endless creativity and detail. Embedded in these images are artifacts from Japanese culture that give the settings both a sense of realistic depth and mythical transcendence. On a more personal note, this is the first movie that I’ve seen in 3D since 2010’s How to Train Your Dragon and I was as underwhelmed with the overall effect this time around as I was 6 year ago. While Kubo isn’t egregious in its use of the format, very little is gained from it either and a layer of vibrancy is unquestionably removed with the dark tint of those tacky and inexplicably unchanged 3D glasses. Whether you see the 3D version or what I would imagine is the brighter and crisper 2D iteration, I can recommend this as a vital stop-motion masterwork, no strings attached.